Home > Granting > Know. Act. Give. 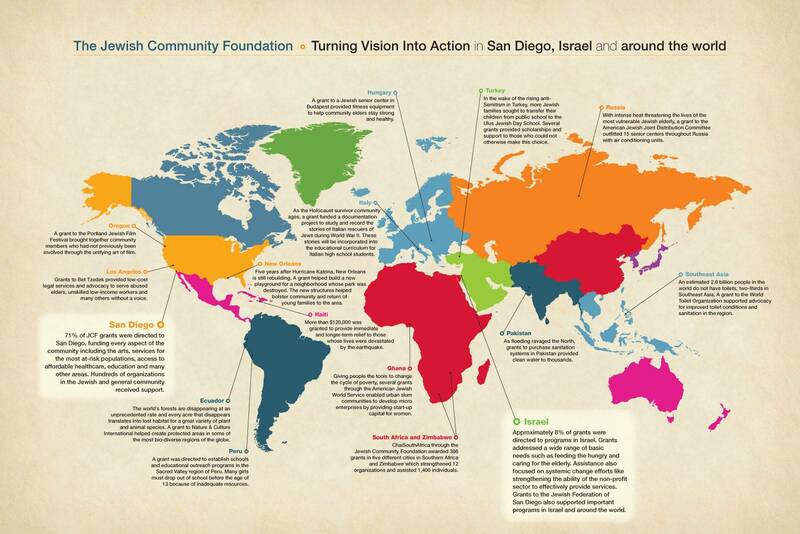 The Foundation supports a vibrant Jewish and general community in San Diego and Israel, as well as causes both nationally and internationally. We provide giving ideas focused around a general cause. Our collective approach allows for larger grants to make an even bigger difference. This has been a devastating time here in California. We are seeing the deadliest and most destructive wildfires in the state’s history. More than 60 people have now lost their lives — and authorities fear that assitional bodies will be found. An unprecedented 300,000 people have been evacuated from their homes statewide, as 9,000 plus brave firefighters battle fires across the state. The relief efforts are tremendous and will be ongoing for quite some time. We at the Jewish Community Foundation want to share these organizations that are providing relief and support in the affected areas. The Jewish Federation of the Sacramento Region is located about 90 miles south of the Butte County Camp Fire. They are collecting material goods for the victims and are also asking for donations to help recovery efforts. As of today, 66 individuals have lost their lives and the homes of 6,500 families have burned to the ground making this the most destructive fire in California history. The Jewish Federation of Greater Los Angeles has opened an LA Wildfire Relief Fund – 100% of all funds raised will go to individuals and institutions affected by the fires. The Los Angeles wildfires have been burning for days and thousands of individuals and families have been evacuated and displaced, and a number of Jewish institutions have been destroyed or damaged, including 3 well known Jewish camps in the Malibu hills. The Humane Society of Ventura County is accepting animals evacuating from the Hill and Woolsey fires. You can donate directly to the organization or purchase items, like food and toys through their Amazon wish list, here: www.hsvc.org/donate. To recommend a grant to these or any other organizations from your Jewish Community Foundation Donor Advised Fund, please log in to JCFConnect or email Lizette Safa. Standing Together Against Hate – The Jewish Community Foundation of San Diego stands with the Jewish community in Pittsburgh and around the world. Here are a few granting opportunities. The Jewish Community Foundation has established the Pittsburgh Chesed Fund; 100% of your gift will go to support ongoing needs in Pittsburgh as well as emerging needs in San Diego to provide security and combat anti-Semitism. The Jewish Federation of Greater Pittsburgh has established the Victims of Terror Fund to assist affected families with their immediate needs. To recommend a grant from your Jewish Community Foundation Donor Advised Fund, please log in to JCFConnect or email Lizette Safa. If you would like to share a condolence message with the Pittsburgh community email it to: WithPittsburgh@jewishfederationsandiego.org. The past couple of months have been devastating in Indonesia. There have been five major earthquakes, landslides, and a tsunami. The Indonesian islands of Lombok and Sulawesi were hit the hardest. Approximately 1,900 people have died, 420,000 have been displaced, and 191,000 are in need of urgent humanitarian assistance. The American Jewish Joint Distribution Committee (JDC) is on the ground and responding to emergency needs. JDC has been in Indonesia since 2004, and is deeply involved in the ongoing humanitarian work in the region. As these efforts continue, we at the Jewish Community Foundation want to share this opportunity for your consideration. Valid for grants submitted by November 1, 2018. The Leichtag Foundation has generously offered a challenge grant to all Jewish Community Foundation donors to support relief efforts for the victims in Lombok and Sulawesi, Indonesia. Every grant recommended to the JDC will be matched, up to a total of $18,000. To recommend a grant from your Jewish Community Foundation Donor Advised Fund, please log in to your JCFConnect account or email Lizette Safa. As hurricane relief efforts continue in Texas and Florida, we at the Jewish Community Foundation want to share additional opportunities for your consideration. The wide impact of Hurricane Irma has been catastrophic. Several million homes are still without power. Dozens of people have lost their lives and thousands of homes have been destroyed. The shelters are still occupied and the relief needs are critical. Continued support and aid is desperately needed. Valid for grants submitted by October 1, 2017. The Jewish Federation of San Diego County, along with the Jewish Federations of North America (JFNA), has set up a Hurricane Irma Relief Fund. 100% of your gift will go to organizations on the ground helping with immediate relief efforts. Feeding Florida’s statewide network of food banks stand ready to mobilize and provide relief to individuals and families affected by Hurricane Irma. Every dollar of your donation will be directed to statewide food banks to provide food and supplies to those impacted by the hurricane. Irma Community Recovery Fund – This fund, specially established after Hurricane Irma, will support relief efforts for Florida’s marginalized communities, ensuring that residents in poverty have access to critical services and resources. NECHAMA (meaning comfort or solace) is a volunteer-driven disaster response, recovery, and preparedness organization. Their support continues across multiple states recently ravaged by hurricanes and torrential storms. After receiving an overwhelming number of inquiries from citizens and companies who want to help, Houston Mayor Sylvester Turner has established a disaster Relief Fund that will be housed at the Greater Houston Community Foundation. The Houston Food Bank is a member of the nation’s largest non-governmental domestic hunger relief organization, Feeding America, with the goal of making food accessible to hungry people in their greatest times of need. Every dollar donated to the Houston Food Bank provides the equivalent of three meals for an individual. If you would like to recommend a grant from your Donor Advised Fund, please log in to your Donor Central Account or email Lizette Safa. Since Tuesday, November 22 a wave of wildfires, caused by weather and arsonists, has swept across central and northern Israel. According to authorities, firefighters have dealt with an astonishing 1,500 fires that have been reported. Due to the fires, 70,000 people were evacuated and 700 homes have been destroyed or badly damaged. Over 32,000 acres of forests have been wiped out. Although the fires are now under control and residents of Haifa were allowed to return home, the relief needs are vital and ongoing. The Federation of San Diego, along with the Jewish Federations of North America (JFNA), has set up an Israel Fire Emergency Fund. 100% of your gift will go to aid organizations helping those affected. In the wake of the worst fires in Israel’s history, JNF is addressing the immediate and long-term needs of the land and people of Israel, including intensive reforestation of areas destroyed by fires, critically needed fire trucks, emergency response vehicles, equipment and other services. Southern Louisiana has been hit hard with record-breaking rains and flooding. What has been declared as a federal emergency has left 13 people dead and thousands homeless. 31 inches of rain fell over a three-day period from Friday to Sunday, August 12-14th. About 40,000 homes have been affected by days of this devastating flooding and approximately 20,000 people have been rescued. The needs for these people is and will continue to be substantial. Both Jewish and non-Jewish people need our help! The Federation of San Diego, along with other Jewish Federations across North America are raising funds to support the Jewish Federation of Greater Baton Rouge as they meet urgent needs. 100% of your donation will go to the Baton Rouge Flood Relief Fund. Second Harvest Food Bank is responding to the third major natural disaster to hit South Louisiana in just six months, sending thousands of pounds of food, water, and cleaning supplies to flood victims in Tangipahoa Parish, Lafayette, and Baton Rouge. The raging wildfire continues forcing thousands of evacuees in Canada to seek safe ground. The blaze is located in Fort McMurray, Alberta and so far has destroyed or damaged 1,600 buildings and homes and has grown to over 330 square miles. A state of emergency has been declared and a wider mandatory evacuation area has been imposed as Alberta deals with this rampaging wildfire. The needs for the evacuees are tremendous at this time. Supplies like food, water, blankets and shelter are critically needed. Please see below for ways to help. The Calgary Jewish Federation is supporting the efforts from their emergency relief fund to help citizens of Fort McMurray get through this crisis. You can help too! Click here to donate to this fund. This Israel-based non-profit that provides life-saving disaster relief and long-term support in crisis areas all over the world has also joined to help. They already have a volunteer group on the ground in Alberta assessing the situation in evacuation areas set up near Fort McMurray. Both these organizations can also be supported via the Jewish Federation of San Diego County who is also keeping a watchful eye on the situation. In the wake of the devastating 7.8 magnitude earthquake that struck Ecuador in mid-April, the American Jewish Joint Distribution Committee (JDC) is there on the ground providing relief and assistance to the victims. This powerful disaster has killed hundreds, injured thousands and leaves behind masses of destruction. The JDC, along with partners, is providing aid to those who need it most. They are supplying food, water, medical equipment and supplies, water filters and purification tablets, solar panel lamps, and post-trauma kits for children. To help, please click on their name below. If you would like to recommend a grant from your Donor Advised Fund to the JDC, please log in to your Donor Central Account or email Lizette Safa. Record-breaking rainfall has been pouring down on Houston, Texas and 9 surrounding counties for several weeks. A state of emergency has been declared due to this deadly flooding. The mass flooding has already taken several lives, left hundreds of people and families to be rescued and thousands without power. This crisis has also widely affected the Jewish community living in these parts. The United Orthodox Synagogue in Houston was hit hard and took in some 3 feet of water, dozens of families are displaced and more rain is on the way. Both the Jewish and non-Jewish communities need our help! These funds will be administered by the Houston Jewish Federation in partnership with its Jewish Family Service Agency and other partners to support both the Jewish and general communities. 100% of your donation will go to help people in need. Terrible violence has spread throughout Israel. In recent weeks, there have been multiple terrorist attacks resulting in many deaths and injuries. The violence is ongoing and security remains a challenge in Israel. We mourn their losses and hope that calm will be restored soon. In the meantime, many donors have asked us how they can help. We encourage you to support organizations that are on the ground providing services to those affected by these horrors. Direct and immediate assistance for those affected by the violence is provided by the Fund for the Victims of Terror, a standing resource that provides Jewish Agency for Israel with the monetary support it needs to rebuild lives. Your support for the Fund for the Victims of Terror helps get aid to those in need immediately following an attack. As always, 100% of your donation to the fund will go to help people in need. AFMDA is Israel’s ambulance, blood-services, and disaster-relief organization, serving as emergency medical first responders for the state’s 8 million people. MDA is the only organization mandated by the Israeli government to serve in this role, but it’s not a government agency, so it relies on people like you for funding. With over 1500 volunteers, 34 ambulances and 162 motorcycles in its own inventory, ZAKA’s mission is to rescue and recover victims following terror attacks, bombings, or natural disasters. The faithful volunteers of ZAKA are on call 24 hours a day, 365 days a year. The Jewish Community Foundation of San Diego extends its support to the people of Nepal and northeast India as they face widespread death and destruction from Saturday’s 7.8-magnitude earthquake and its ensuing large aftershocks. This has been the largest quake to hit the region since 1934. Though tolls continue to rise, more than 3,900 people are confirmed dead and 7,000 injured. The earthquake caused widespread destruction in Kathmandu and the surrounding region, as well as a deadly avalanche on Mount Everest. If you would like to make a grant from your fund to contribute toward relief efforts, the following organizations are providing aid on the ground. The Jewish Federation is mobilizing a communal response with 100% of funds raised supporting relief efforts by the American Jewish Joint Distribution Committee (JDC). JDC’s emergency teams are coordinating with local authorities, the Nepalese and Indian governments, and global partners to address survivors’ immediate needs. This includes working with UNICEF to secure supplies to meet children’s shelter, nutrition, water and sanitation needs. The JDC is also working with the Israel Defense Forces’ field hospital in Nepal to provide medical equipment, including two neonatal incubators. The JDC’s rapid assessment team of disaster experts will arrive in Nepal this week to direct further efforts. International Medical Corps emergency teams are searching for and rescuing earthquake survivors, providing critically-needed care, medicines, and supplies. Teams are also working to ensure sanitation, hygiene and infection control. Tevel B’Tzedek (“the Earth in Justice”) is an Israeli grassroots organization with a long history of providing holistic community development in Nepal, particularly in the areas of sustainable agriculture and clean water. Tevel’s service learning programs engage Israeli and Jewish young adult volunteers in fellowships and volunteerism in Nepal. Working within villages where Tevel has had a presence for years, the Tevel team is providing emergency supplies, including tents, blankets, water purification, food and medication to hard-hit areas. Tevel will next mobilize its Israeli and American volunteers and staff with its Nepali team to help the villages rebuild with basic building supplies, power and other logistical support. Tevel is working closely with the JDC and will sign an agreement to work together on mid and longer term relief efforts. The Jewish Community Foundation of San Diego extends its support to the people of Ukraine during this unpredictable time of political and economic crisis. Ukraine has one of the largest Jewish populations in the world, estimated to be around 300,000. There are approximately 17,000 Jews in Crimea. The impact of this crisis on the weakest members of society, including thousands of elderly Jews, is devastating. As a result, the needs across the Jewish community are growing significantly. The Jewish Federation is directing urgent support to Jews in Ukraine. 100% of the funds granted will support those in need. Jewish Federations of North America and its global partners, including World ORT and the Jewish Agency, continue to assess the evolving situation on the ground. The American Jewish Joint Distribution Committee (JDC) has activated its emergency response network aimed at helping the neediest within Crimea’s ethnically mixed peninsula’s Jewish community to ensure continued home deliveries of food, medicine, heating and cooking fuel, and sustained life-saving care at home for the elderly. Having worked in the region since 1924, JDC has also increased security at select Jewish communal institutions and Hesed social welfare centers. Historic Flooding Has Paralyzed Detroit – You Can Help! Recently, metropolitan Detroit has been inundated with massive rainfall leading to historic flooding, which overwhelmed freeways and surface streets, stranded motorists, destroyed vehicles, and flooded homes and businesses. The Jewish Federation of San Diego County is mobilizing to provide the local community with much-needed support. Emergency aid raised will be used to provide financial need beyond the current scope of those already assisting these families. Federation works hand in hand with those already on the ground to help families in Detroit rebuild and restore their homes and communities. 100% of all contributions will go to the Detroit Flood Emergency Fund. The last weeks have seen instability, terror and casualties throughout Israel. Over 700 rockets have been fired at Israel with some reaching the Tel Aviv area and even Jerusalem. Rockets were also fired Friday for the first time in this conflict from neighboring Lebanon. As many as three-quarters of the Israeli population is threatened, who rush to take refuge in bomb shelters at a moment’s notice. The people of Israel are struggling with the physical, emotional and psychological impact of rocket fire. If you would like to make a grant from your fund to contribute toward relief efforts, please see the giving opportunities below. We will continue to monitor the effects of the fires and provide updates on further needs in our community as necessary. The Jewish Federation of San Diego stands shoulder to shoulder with the people of Israel at this critical time. Your donation will help our partners, the Jewish Agency for Israel (JAFI) and the Jewish Joint Distribution Committee (JDC) to move children in the strike zones out of harm’s way, provide trauma counseling for those living in terror, and help those whose homes, and lives, have been destroyed. American Friends of Magen David Adom, Israel’s ambulance and medical relief service, has treated over 150 cases. Magen David Adom paramedics are out amid the violence, searching for people injured near blast sites and evacuating Israelis suffering from everything from shrapnel wounds to cardiac issues, trauma, and other stress-related disorders. There is particular need for special medical equipment, oxygen masks, blood services supplies and communications systems. The Friends of the Israeli Defense Forces (FIDF) provide special support and services to members of the military particularly lone soldiers, offering care packages, respite care, and extra support. Funds raised by FIDF during this operation will be targeted to those soldiers on the front and their families. The Jewish Community Foundation of San Diego extends its deepest sympathy and support to our fellow San Diego residents affected by the recent fires. We are grateful to the organizations that extended their resources beyond their usual programs to provide emergency and first response services. If you would like to make a grant from your fund to contribute toward relief efforts, please see the giving opportunities below. We will continue to monitor the effects of the fires and provide updates on further needs in our community as necessary. 2-1-1 San Diego mobilized over 800 volunteers to field tens of thousands of calls, dispelling rumors about the fires with round-the-clock safety, emergency and evacuation information.San Diego Regional Fire Foundation supplied necessary new equipment and resources to firefighters. American Red Cross of San Diego / Imperial Counties provided first response services to individuals and assessed community needs. Jewish Family Service distributes food and personal supplies monthly at Camp Pendleton, an area surrounded by multiple fires. YMCA of San Diego offered free emergency childcare at several locations during school closures due to evacuations and precautions. The Jewish Community Foundation of San Diego extends its support to the people of the Philippines as they face catastrophic destruction from Super Typhoon Haiyan, described as the strongest tropical cyclone to make landfall in recorded history. Nearly 9.5 million people have been affected, with over 600,000 displaced, and an anticipated death toll of 10,000. It is meaningful to note that the Philippines offered safe haven to more than 1,000 Jewish refugees during World War II. As a community, it is a privilege to honor that historic debt. In fact, the Israel Defense Forces are currently there providing assistance, including search, rescue and medicine. If you would like to contribute toward relief efforts, the following organizations are providing aid on the ground. The Jewish Federation is mobilizing a communal response. 100% of funds raised will support relief efforts by the American Jewish Joint Distribution Committee. The International Medical Corps emergency teams have been coordinating with partners on the ground, looking to fulfill basic needs such as food, water and medicine, as well as ensuring sanitation, hygiene and infection control are priorities. STEM education is an interdisciplinary and applied approach that bridges science, technology, engineering and mathematics with real-world, problem-based learning. STEM education removes barriers between the four disciplines it comprises by integrating them into one cohesive teaching and learning paradigm. Such an interdisciplinary approach is necessary to prepare students, as new innovations and inventions tend to be made at the intersections of these four disciplines. Read more on the topic in this white paper prepared for the Jewish Community Foundation and click ‘more’ below to find out about granting opportunities in San Diego and Israel. In addition, find an overview of how the US and Israel rank with science and math test scores from Gerald Solomon, Executive Director of the Samueli Foundation. Broadcom MASTERS (Math, Applied Science, Technology, and Engineering for Rising Stars) is the national science, technology, engineering, and math competition for U.S. 6th, 7th, and 8th graders. It is a program of the organization Society for Science & the Public, and inspires and encourages the nation’s young scientists, engineers and innovators. Nominees enter the competition by completing an application explaining their science project and demonstrating their use of STEM principles in the development and presentation of their project. Competition finalists showcase their projects for the public and compete as teams in hands-on STEM activities. CONNECT’s STEM program, Entrepreneurs for Young Innovators, inspires middle and high school students to pursue careers in life sciences and technology by introducing them to local entrepreneurs with exciting technology products. Local CEOs visit classrooms to tell their stories, describe their companies, demonstrate the products they are creating and explain how STEM classes can help prepare for college and rewarding careers in technology. The CONNECT summer internship program inspires high school students to work in the field of computer science and programming. Interns are matched with a host company for a 6 week-long internship and present a summary of their work experience to the CONNECT community. CONNECT reached 2,500 students by the end of the 2012-13 school year. Since 2010 (inception of the program), CONNECT has visited 30 schools and organizations and has reached 6,200+ students. Housed in a 15,000 square foot facility in South San Diego, the Elementary Institute of Science (EIS) is a science enrichment program dedicated to nurturing the intellectual curiosity of San Diego’s children by providing hands-on experiences to stimulate an ongoing appreciation and understanding of science, technology and the environment. EIS classes take place in a lab setting with no more than 10 students working with an instructor. 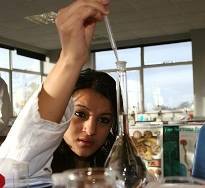 Labs focus on the areas of chemistry, computer science, engineering, geology, health, natural science, photography and technology. Math for America San Diego (MƒA SD) supports highly trained, exemplary math teachers who are dedicated to improving mathematics achievement in secondary schools throughout San Diego County. Founded in 2008 by a consortium of educators concerned about the quality of local mathematics education, MƒA SD seeks to attract, train and retain new and experienced teachers who are committed to helping their students understand and appreciate mathematics. • increase student desire and ability to understand mathematics. To date, MƒA SD has 43 fellowship recipients teaching in 33 schools in 10 districts throughout the region. The program is the recipient of two National Science Foundation Robert Noyce Teaching Scholarship Program awards and is supported by local private funding. For the past decade, Ocean Discovery Institute (ODI) has been empowering urban and diverse young people to protect our ocean and natural environment, improve the health of our communities, and strengthen our quality of life. ODI is the only nonprofit in the San Diego region expressly dedicated to educating urban and diverse youth through ocean science. All of the primary concepts in science and conservation can be taught through ocean science. Using the ocean, an extraordinary educational resource intrinsic to San Diego, as an educational tool capitalizes on young people’s instinctive attraction to the sea and builds knowledge of our planet’s defining feature. ODI’s initiatives combine education, scientific research, and environmental stewardship. Currently these tuition-free initiatives reach 5,000+ low-income students each year, including school-based programs and a series of interconnected after-school and summer programs and support services for middle school, high school and college age youth. To ensure continued effectiveness, a professional external evaluator conducts regular program assessments. San Diego Science Alliance (SDSA) strives to improve K-12 science education in San Diego County, delivering quality experiential programs, building bridges between the region’s diverse business, education and scientific research communities, and fostering public/private partnerships to increase science literacy. It reaches 30,000 K-12 students annually in every school district in San Diego County. SDSA delivers innovative and engaging science programs, such as a High Tech Fair and Robotics Education, responsive to the interests and needs of K-12 students, teachers and community partners. BE WiSE, a program of the SDSA, invites girls in seventh and eighth grades to Science Overnights at local science institutions to explore their interests in science, hosts events for BE WiSE alumnae in high school to encourage their selection of more courses in science and math, and exposes these girls to adult women scientists who share their knowledge about, passion for, and experiences with science and engineering careers. Events are scheduled throughout the academic year and during the summer, when more intensive experiences are offered. The Fleet Science Center aspires to inspire and educate students and teachers through a hands-on approach to science education that will feed and maintain a steady pipeline of STEM-capable graduates and life-long science learners. • Is an after-school outreach program for girls in fourth through twelfth grades. • Focuses on underserved girls in San Diego-area schools. • Uses project-based classes that help girls to make concrete connections to everyday life as they develop creative thinking and problem solving skills. • Adheres to a project-based format, with every four to six sessions focusing on a different scientific project or challenge. This format has proven successful because it allows for the integration of science with other subject areas. • Classes are taught by the Fleet’s science education staff, with input and collaboration from classroom teachers at each of the eight school sites. • Integrates girls at the middle and high school levels as mentors for younger girls. • Expects that girls show increased knowledge of basic science and technology concepts, improved science self-concepts and attitudes, and expanded awareness of STEM-related career opportunities. UCSD’s CREATE STEM Success encompasses its STEM outreach programs and is focused on improving and networking UCSD’s resources for the K-20 STEM education pipeline in San Diego. This initiative facilitates their integration, improvement, and collective impact. • Jacobs School of Engineering: The Center for Inclusion, Diversity, Excellence, and Advancement (IDEA Student Center) at the Jacobs School of Engineering is committed to fostering a supportive environment for diverse engineering students as well as increasing K-14 student knowledge and awareness of engineering. • Division of Physical Sciences: The California Teach program provides a deeper, richer understanding of mathematics and science, while enhancing the ability to effectively communicate mathematical and scientific ideas to others. • Qualcomm Institute: The myLab Program combines engineering, art and technology with hands-on experience to inspire passion in engineering. myLab Program partners with university colleagues to provide undergraduate workshops, internships, and K-12 outreach. • The UC San Diego Academic Connections pre-college program connects high-achieving high school students with college subject matter courses led by graduate students in a wide array of academic disciplines, renowned UCSD faculty researchers and experts in the fields. • The Preuss School Science Enrichment Program offers activities that will inspire interest and engagement in science as a field of study and as a career for Preuss students. It focuses on three projects: 1) Biotechnology Labs, 2) Science Fair Tutorial and 3) Girls in Science. The San Diego Jewish Academy (SDJA) Science Department aims to create lifelong learners of science who are inspired to question and understand the world. Middle and high school students are guided on an adventure through hands-on laboratory activities, group interactions, lectures, and on-campus visitations by specialists in their fields. STEM students grow in confidence as they pursue their own ideas and interact within the scientific community. Students apply creativity, innovation and entrepreneurship to their projects. In the high school’s two- to three-year STEM program, self-driven students work as individuals or teams on STEM research and development projects. Students may develop projects onsite at SDJA or elsewhere in San Diego with the guidance of external mentors. Students compete at high-level county, state, country and international STEM competitions. Through this award-winning program, three winners placed in the INTEL International Science and Engineering Fair, which is considered the top high school science fair in the world, and one placed first in the 2012 Google Science Fair. Soille San Diego Hebrew Day School is the latest school to join the ranks of prestigious private schools to adopt Singapore’s national math curriculum. Students understand the concepts and make connections between the numbers and learn how to do mental calculations. The program uses visual elements such as model-drawings and picture-based problem solving and moves quickly from pictorial illustration to abstract concepts. The children are encouraged to learn through discovery and to use a variety of manipulatives that enhance concept development. They will develop understanding and insight into the patterns of mathematics through use of concrete materials, learning through discovery and an environment of positive reinforcement. They are taught to see the relationships and interconnections of mathematical ideas and concepts. Standardized tests show that Soille is graduating young men and women who demonstrate achievement in line with students in the finest schools in America. The Ahed is an organization of local Negev Bedouin academics, public servants and university graduates dedicated to advancing the Negev Bedouin community. The school aims to enable its students to participate in the broad high tech era as fully achieving equals and to move toward being fully participating members of Israeli society and the global economic future. It is believed that the creation of this school is the single most important action that can be done to raise the overall level in the Negev Bedouin community. Ahed aims to cultivate excellence and rigor combined with leadership development, social awareness and civic responsibility, while the objective of this endeavor is to enable acceptance of Bedouin students to the exact and bio-sciences faculties of leading Israeli universities. The goals of the museum are to increase interest among the general public in science and technology in the world around us, to promote excellence in sciences among youth, and to present science and technology as an integral part of human culture. It hosts a Young Science Contest and a Science Café, a way for children to explore science in a format less rigid than the classroom-and-desks environment. Center for Initiatives in Jewish Education (CIJE) programs help students master scientific language and concepts, tackling real-world problems in science and engineering through inquiry-based learning and hands-on projects. Initiatives include Science Labs for hands-on learning, math tournaments and virtual competitions, engineering-related study, career preparation and Teacher Training and Professional Development for teachers to ensure maximum impact of STEM education. In its 40 years of activity, Center for Educational Technology (CET) has invested significant resources in carrying out its social mission, and has established its expertise and reputation in the education system in Israel. Main areas of activities are: development of state-of-the-art textbooks and digital content, establishment of rich websites using top-of-the-line technologies, paving new ways in professional development for educational staff and creating online environments and tools for assessment & evaluation. CET adapts products, services and programs to the needs of every population segment: Israeli-born and immigrant students, students from metropolitan and peripheral communities, Hebrew speakers and Arabic speakers alike – taking into account the needs and values unique to each community. Ofanim converts buses into mobile classrooms and introduces at-risk youth to the highest quality instructors and after-school enrichment programs in computers, science, math, English, and two new robotics programs co-sponsored by the Technion Israel Institute of Technology in the North and Ben Gurion University in the South. Founded by Israeli social and business entrepreneur Haim Dahan, Ofanim’s inspiring vision is to empower the next generation of Israeli leaders, scientists and entrepreneurs. In 2007, World ORT embarked on a cutting-edge program, Science Journey – Kadima Mada, to redefine science and technology education in Israel, specifically in the periphery. Established in partnership with Israel’s Ministry of Education, this multi-faceted program combines state-of-the art, interactive classrooms and progressive science and technology learning with critical investment in advanced teacher training. Today, Kadima Mada is active in over 165 schools, has trained and assisted some 3,300 teachers and serves over 100,000 pupils in under resourced areas. World ORT provides support for smart classrooms, science and technology centers throughout Israel and mobile science exhibitions. The Jewish Community Foundation of San Diego extends its deepest sympathy and support to the people of the Colorado Springs area in the wake of the wildfire that killed two people and burned nearly 500 homes. The fire, which is still not contained, has consumed over 14,000 acres. It has been termed the most destructive fire in Colorado state history. If you would like to provide assistance to those impacted by this crisis, please see the giving opportunity below. The Jewish Federation has opened a mailbox to gather aid for Colorado wildfire victims. Funds will be directed to the Allied Jewish Federation of Colorado’s Colorado Fire Relief Fund. The fund will support Jewish and non-Jewish families affected by the fire through financial donations to agencies at the heart of the situation, as well as support first responders who are combating the fires. One hundred percent of the funds donated will support relief efforts on the ground.